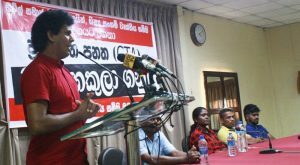 Whenever the government was unable to find solutions for issues of the people it always tried to increase its powers to suppress the people and the proposed ‘Counter Terrorism Act’ is to prevent any people’s opposition to the government that would definitely rise up in the country says the National Organizer of National Trade Union Center (NTUC) Wasantha Samarasinghe. When masses agitated against the Prevention of Terrorism Act as it violated human rights, the government intends bringing in the ‘Counter Terrorism Act’ in a bid to down two birds with one stone said Mr Samarasinghe. He said the proposed Act should be defeated to protect the rights of the masses. He made these observations at a seminar held in Colombo organized by NTUC for representatives of trade unions.